Hope you are enjoying your Sunday afternoon! As an aside, I like to read books with baseball themes to them. I am not a fast reader by any stretch. Books really are something of an escape for me: I get in them, I essentially tune out the world, and I take just about every word on the page. I'm not quick about it. I say all that to say this: I just finished "Chin Music" by Lee Edelstein. I will do a review on here at some point, but I just want to get the word out: This is a great story. The best part is that it should appeal to just about anyone. It is family-centric (though don't let your kiddos read it unless you've crossed the "F-Word" threshold) and tells a wonderful tale of loss and redemption. Oh, yeah, it also happens to be about baseball and memorabilia, Babe Ruth and features some of the best head-smacking moments I've read. Managers, remember the draft will close later tonight (between 8p-9p CST), so get your picks in! That's not why you're here. Let's rip some wax while I am waxing nostalgia. 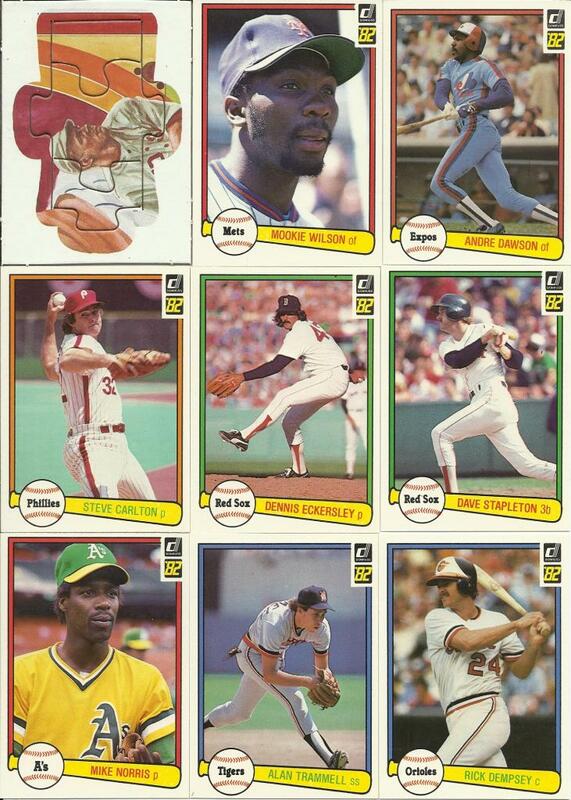 Today, I've got a pack of 1982 Donruss. 15 cards per pack and 1 Babe Ruth puzzle. Well, we basically split the pack! Holy cow, man. Taking a look at some these guys from back in the day certainly will have you thinking back (er, well, if you are old enough to think back as far as '82). Let's see, how many HOFers do we have here? Ruth, Dawson, Carlton, and Eckersley. That's 1-in-4 cards from the pack. Sweet!